Last Sunday I was up in Edinburgh acting as unofficial support for some friends who were running the Edinburgh Marathon, which culminated the weekend of the Edinburgh Marathon Festival. The atmosphere was great for the runners, with good crowds of spectators throughout the course. The weather was 12-15 Celsius, which was a bit too warm for some competitors, who claimed dehydration as a cause for a slower time. 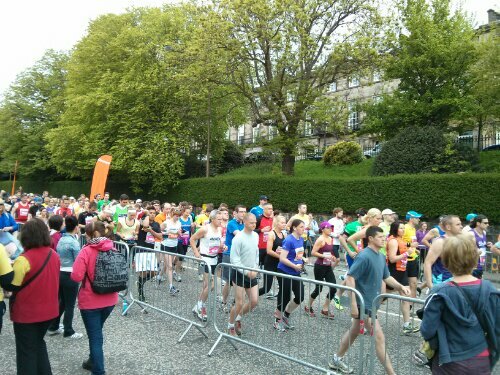 Regardless the Edinburgh Marathon bills itself as ‘the fastest marathon in the UK’. The course started in the heart of Edinburgh minutes away from Waverley train station with two different start locations depending on anticipated finish time. The course then wound its way up to the flat coastline, then east hugging the coast past Portobello (10k), Musselburgh, Prestonpans, Cockenzie just over halfway, then past Longniddry. There’s then a return stretch back west with the 30k marker, back past Longniddry before finishing in Musselburgh. Buses are provided for competitors to return to the centre of Edinburgh and there are car parking facilities if you will be getting collected, but expect a 20 minute walk from the finish line to transport. There were no space blankets or much post-race food and drink for competitors, so plan ahead and pack any food, drink and warm clothes you will need in a bag and leave it with the bag drop service. Reunion areas for runners and supporters were well marked out. Unfortunately the queue for the beer tent sprawled for a hundred metres. Congratulations to all competitors and the organisers.